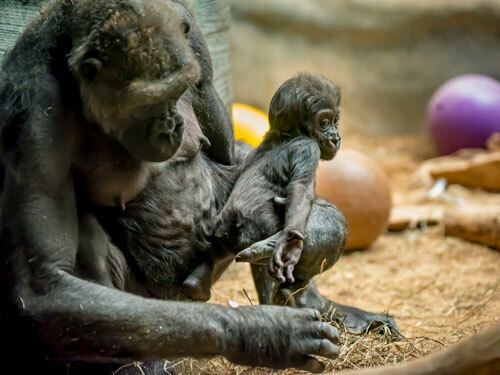 The Zoo’s most recent addition to the western lowland gorilla family, Zahra (a Swahili word meaning blossom, flower or beauty), marks her 6-month birthday this March. 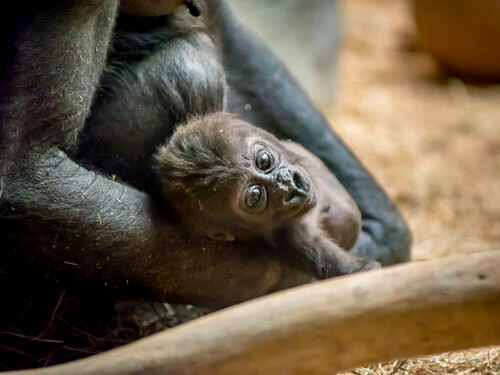 She was born Sept. 9, 2017 to mother, Naku, and father, Cassius. 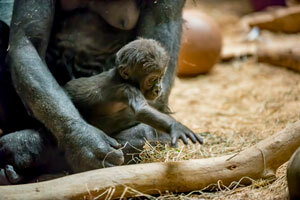 For the first several months of life, Zahra was continuously carried around by Naku. 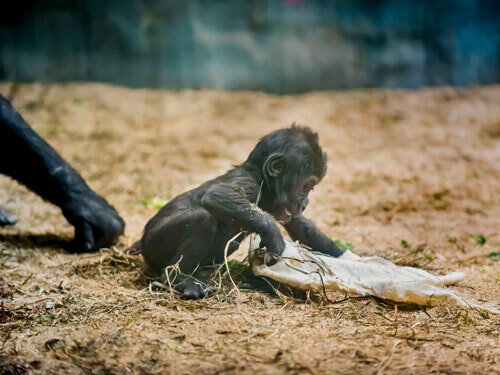 Then, as development progressed, the baby could often be seen clinging to Naku’s stomach, but did not walk on her own. Now, the latest milestone for Zahra was to venture off of mom to attempt to walk on her own. Zookeepers estimate Zahra now weighs between 8 and 10 pounds. In addition to Naku, Cassius and Zahra, the family group also includes female Shalia and her offspring, 3-year-old male Sulaiman. Naku has progressed into a wonderful mother, and visitors are entertained by 3-year-old Sulaiman’s curiosity of the new baby. Zookeepers say Sulaiman and Zahra are interacting well together. Lately, he has been very gentle and has been seen cuddling with the baby, all while Naku keeps a close eye on the situation. Anytime Sulaiman looks like he wants to pick up Zahra, Naku will step in and take the baby. There has also been some interaction between Cassius and Zahra, and overall dad is gentle, but steps in if Sulaiman is doing something inappropriate with Zahra. Everyone is curious and excited to see how the two half-siblings will eventually play and fully interact with each other. However, that probably won’t happen until Zahra is closer to 1 year old. For now, visitors can see Zahra continuing to explore the world around her, as she learns to walk, and ventures about her exhibit. In the lowland tropical rainforests of central Africa, western lowland gorillas are critically endangered, but are more common than their relatives, the mountain gorillas. 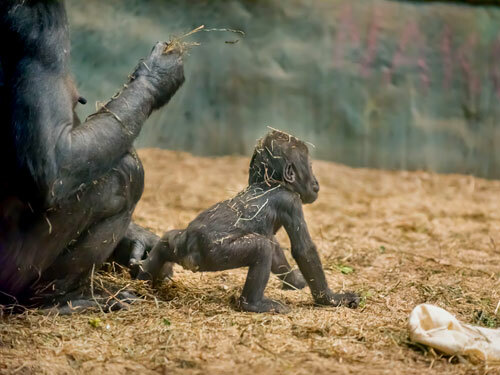 Western lowland gorillas face increasing threats from disease, wildlife trade, poaching and human encroachment. 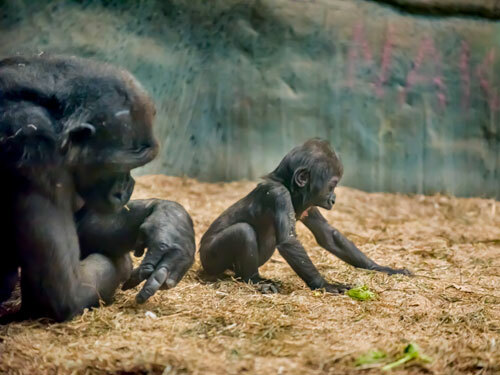 Over the past 20-25 years, more than 60% of western lowland gorilla populations have seen a marked decline. 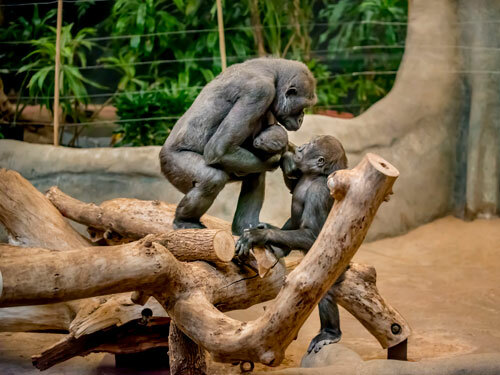 There is not a set schedule for the family group to be seen on exhibit, but on most days they can be seen from 9:00 a.m. to 3:30 p.m. in the indoor Gorilla Exhibit.